A number of people have asked me for ceremonies and activities that help facilitate sacred work on the land in various ways. Why would we want such ceremonies? Quite simply, because we can get the most effect by combining actions out in the world with ritual and other forms of magical practice on the inner worlds. For many years, I’ve been using my druidic practices to help my work with plants and gardens. So in addition to the practical work of growing my own food on my homestead, practicing permaculture, regenerating lawns, and building a healthy ecosystem, I designin with the elements in mind, performing land healing and garden rituals, and engage in other sacred practices. These two parts form a cohesive whole that unifies spiritual practices with everyday living. Today, I’d like to share the first of a series of posts on principles from the druid tradition that can be used both for designing sacred garden spaces and for simple rituals and sacred activities that can be used with gardening. And because I’ve decided to spend some extra time in my art studio in the winter months, so I’ve done my best to provide some illustrations for this post :). In order to craft effective ceremonies to support sustainable activities, we need an underlying theory that helps us work with various flows of energy. The Druid Revival has a set of three elements (we like to do things in threes) that are quite useful to understanding and enacting some sacred space rituals and building sacred spaces. A lot of current pagan and earth-centered practices use four elements, and there is so much out there about the four elements already, that I don’t really need to say a lot about those (and they are effective and useful for sacred gardening practice–see my elemental tree planting ritual here, for one such example). The three elements are worth considering as an alternative or used in conjunction with the four elements, especially in regards to nature spiritual practices surrounding the land. These three terms use Welsh words and pronunciations (like many other things coming out of Revival Druidry). They do not cleanly map onto the four elements, so don’t try to see them that way. See them, instead, as an alternative elemental system that emphasizes different properties of the world–all elemental systems do that, generally–they serve as an archetype of things that we can see or experience or know. They are three archtypes, three ways of representing the inner and outer worlds of our experience. Nwyfre (NOOiv-ruh): This first druid element is represents the life force and consciousness within each living being. It is associated with the sky and the heavens; it represents the spirit of things; the mind. The term means “sky” or “heaven” in the Welsh language. Nwyfre in a gardening/growing/land healing context refers to the spirit of life flowing through each of the plants. This is the spark of life that encourages a seed to grow; it is the magic within the plant; and in some forms of herbalism, this would be the spiritual energy of the plant and the plant spirit itself. Nwyfre is not a physical thing (like Gwyar or Calas, see below); it is the spirit behind the physical thing. Nwyfre is often what we refer to when we talk about things unseen, “energies” of spaces and people. Nwyfre is also the mental processes associated with gardening–its the design work, the thoughtfulness, the planning and careful consideration. Its the feeling you get when you enter the garden; its the awareness that is awakened with a sacred connection to the plants. Gwyar (GOO-yar) – This druid element represents the principle of flow, of movement, and of change. It is associated with the energy of the water (although is not limited to it); it represents the change that is inherent in all living things. The term means “flow” or “fluidity” in the Welsh language and we can refer to it as energy flows (in physical manifestation) of all kinds. Gwyar is responsible for the change we see in the plants across the season; its the growth of the seed from spout to adult plant and finally into decay; its the flow of the seasons moving ever forward. Gwyar is the flow of the sap in the maple trees that first signals spring; its the growth of the plants; the budding and leafing of the trees; the ripening of the fruit; and the eventual composting and decay at the end of the season. 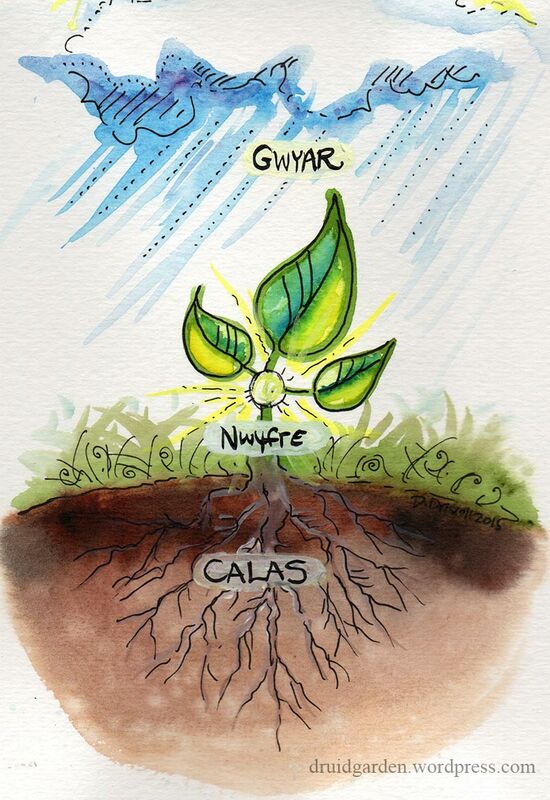 Gwyar is the flows of nutrients in the great soil web of all life. It is the principle of Gwyar we see in photosynthesis, the conversion of light into energy and oxygen by plants. For homebrewers, it is gwyar that allows the physical fermentation and transformation of grains or fruit into alcohol. It is this principle of flow in herbalism, also, that allows the medicine to move from the plant matter into a menstra (for tea, tinctures, etc). When permaculture designers talk about “catch and store energy” we are referring to harnessing the Gwyar in the land for common good (through rain barrels, swales, solar power, and so on). Calas is the physical being of the plants in the garden, the soil, the microbial life. It is Calas you feel when you pick up the rich soil and run it through your fingers. It is Calas that is the feeling of your tools in your hand (although its Gwyar that makes those tools work!). Its Calas that is in the vegetables sitting in your harvest basket and ready for your plate. All of the physical manifestations of your garden; the solidity of the pathways, the size of the beds, the physical structure of the plants; the weight of the stones–these are Calas. You can map these elements onto another triad in the druid path–the triad of earth (calas), sea (gwyar), and sky (nwyfre). If you are interested in working with these three elements, I would start by suggesting that you spend time meditating on each of them and also spend time examining these principles at work in the world. For example, as I look down my street, I see the Calas in the pavement, in the trunks of the strong trees, in the physical body of the people walking there. I see Gwyar in the rain falling on the street, in the movement of the branches in the air, in the swinging of the hands and walking of the people. I see the spark of Nwyfre in the laughter of the children crossing the street holding hands in the rain. As a second example, we can think about the honeybee. The honeybee’s physical body (legs, wings, abdomen, exoskeleton, eyes, tongue, and so on) represent Calas. The honeybee’s flight and movement in the hive represent Gwyar. 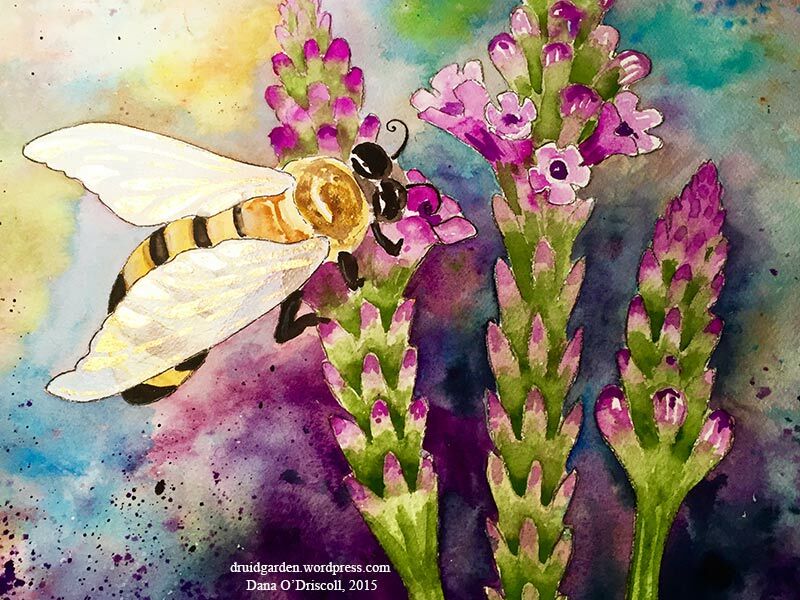 The magic alchemical process that allows eggs in the hive to have the spark of life, the magical process where nectar is transformed into honey, and the blessing the bees bring to the land all can be represented in Nwyfre. I would suggest that if you want to use these three principles in your sacred gardening work, magical practice, or daily life, you spend time with each of them. Spend time focusing on one, meditating on one, writing about it, maybe sketching it or creating a song, and observing it in everyday life. Do the same with the other two–while these three elements are simple on the surface, profound understanding can be found with dedicated study and work with these elements. Now that we have some understanding of the principles behind the three druid elements, we can consider how they can be put to work in a sacred garden space. The other way you can use these elements is by considering their role in the garden design process and think about integrating them physically into our spaces. Let’s look at two such garden designs where these three elements can play a prominent role. 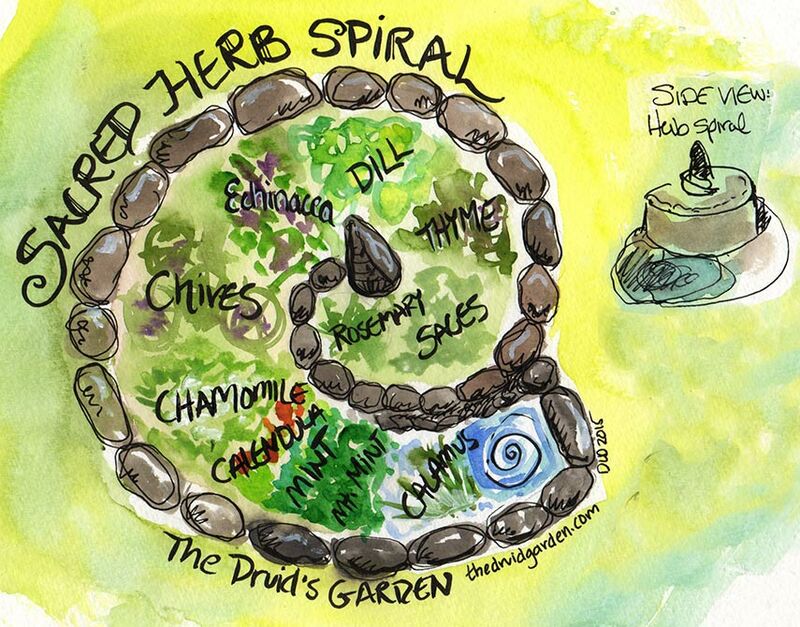 The herb spiral is probably the most quintessential design from permaculture; the spiral is built up so that the top of the spiral is above the earth by several feet, making it drier, and as the spiral goes down, it has various small microclimates. Some spiral designs (including mine here) include a water feature at the bottom. I like the herb spiral a lot, as its simple to implement, encourages us to think about the plants and their microclimate needs, and looks great. 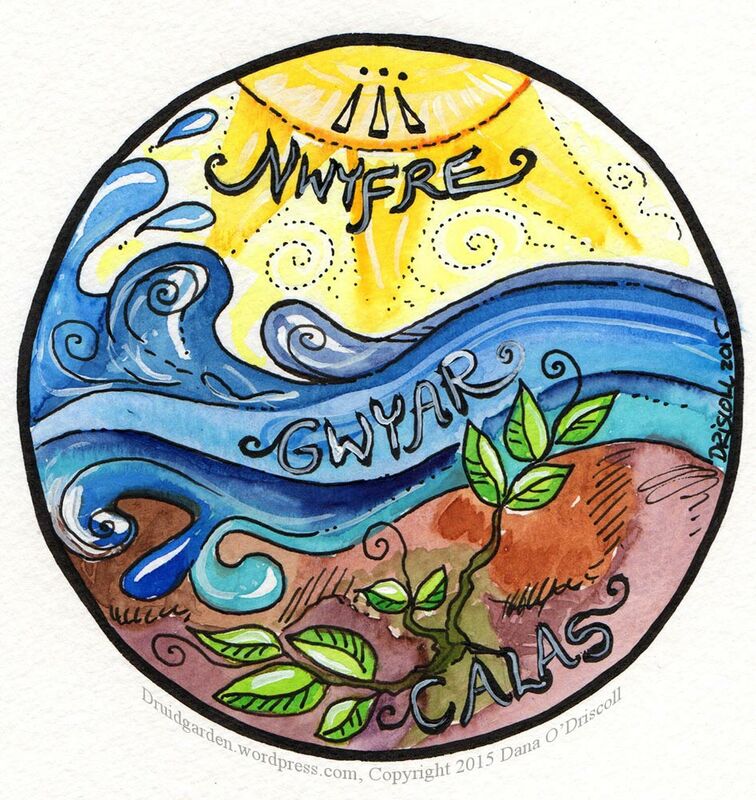 From a magical perspective, we can apply the three druid elements easily into this design: the spiral itself representing nwyfre; the stones, earth, and plants representing calas; and the flow of water and areas of wetness and dryness as well as the encouraged growth habits based on placement through gwyar. There’s also a really good reason to put a standing stone at the very top, buried 1/3 of the way into the soil–stay tuned for my next post for more on the inclusion of the standing stone. You’ll notice in this design drawing I’ve included a number of different herbs, many of them both magical and medicinal. The top of the design starts with the herbs that like it hot and dry–rosemary and white sage being at the top of that list, perhaps with a bit of accompanying garden sage or clary sage. From there we move into thyme and dill, who can handle it a bit dryer, along with echinacea (purple cone flower), a wonderful medicinal. Basil or lovage, too, would work wonderfully around this spot. Chives, chamomile, and calendula (along with others, like New England Aster) fill out the bottom. Next, we get to the pool’s edge. Mountain mint and boneset are two water loving plants that would like that spot, as would any other mint. Finally, the pool itself can contain horsetail (especially if you are using sand in your pool) or calamus, two rooted and water loving plants. This design can be modified to your own herbal interest and specific ecosystem. 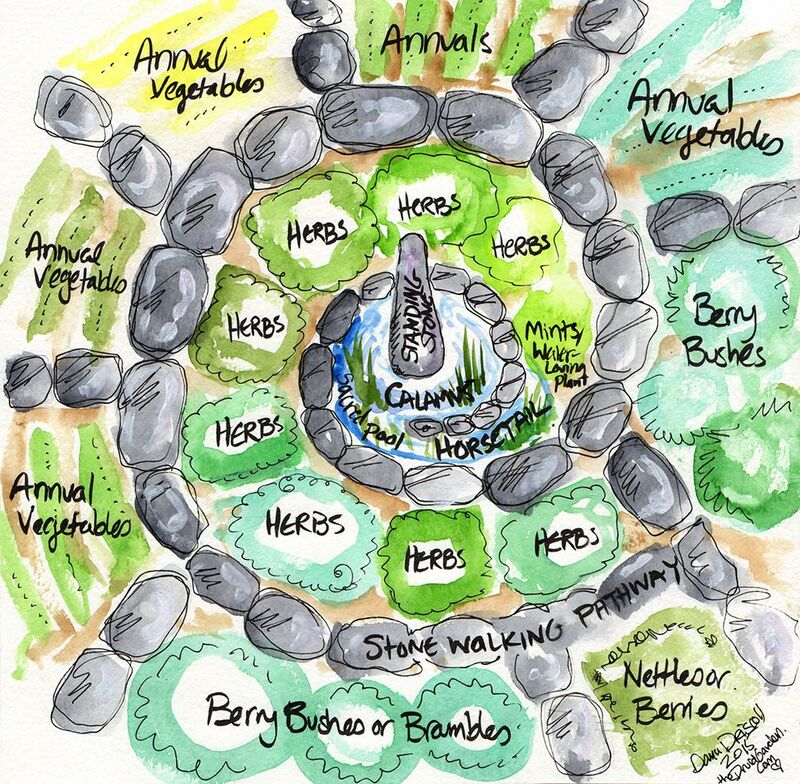 We can expand the idea of the herb spiral to create a larger sacred spiral garden in which things more than just herbs grow. Here’s a simple design for one that honors these three elements as well as recognizes the importance of an 8-fold wheel. This design is flat, and the stone walking pathways (or mulched paths, etc) form the basis of the design. I’d keep the beds in the spiral no more than 3′ across; its harder to manage a bed wider than that (I speak from hard-learned experience!) The center of the garden offers a standing stone (more on that in my upcoming post) as well as a sacred pool with calamus and horsetail. The edge, like the design above, is for water-loving plants, and then any herbs you want to grow work their way outward from the spiral. The outer edges (which can continue on, beyond what I drew) can be home to perennial berry bushes, brambles, etc, as well as rotating annual vegetable crops. I really liked the nettles there, at the entrance, serving as guardians….so many of our forests have those kinds of protectors, and stinging nettle is not only a great guardian of spaces but an incredible medicinal and tasty food! So now that we’ve looked at the three elements in design work, let’s see how we can use them for prayer and planting. Setting up a sacred space and acknowledging the presence of the elements is an important step; its a way to encourage us away from the strictly practical and into the sacred. Another way of doing this in an existing garden space is to setup an altar for the three elements. You can use a flat stone or stump, and on it, place a stone for calas, for example; a bowl of water for gwyar, and some representation of nwyfre (a symbol like a spiral or an awen or else some herbs/incense (sage, mugwort, or lavender are my favorites, but you can also use any blend of herbs that have a strong connection with planes beyond the physical). An alternative is to create a living altar, where you can use three plants to represent them: an earthy or rooty plant for calas (burdock, comfrey, dandelion, or any garden mushroom or mushroom log would be perfect here), a water plant like calamus, horsetail, boneset, mountain mint, arrow root, and so-on for gwyar, and a plant associated with the spirit realm (sweetgrass, sage) or strongly with the sky (a climbing vine like nasturtium) for nwyfre. A good way to choose symbolism for your altar is to meditate on each of the three elements and/or do a free association with them in order to come to a deeper understanding. A daily prayer at your three element altar can be simple and yet effective. I might come into the garden and say this prayer at morning’s first light or before I begin to work in the garden. As you say the prayer, pause after each line. You can touch the elemental representation on the altar as you pause. Then, for Calas and Gwyar use your 5 senses closely to see how that element is manifesting in the garden at each moment. Nywfre will require your inner senses, but it too can be sensed in various ways. This prayer, or another like it, can be used to encourage many things to grow, anything from sprouts on your counter or seeds you have started to the planting of a new garden. I use this prayer this after planting my first sets of seeds in the fertile earth, transplanting seedlings, or putting in new trees or shrubs. Action: Pour a small bit of earth or finished compost over the growing plant/seed/tree. Alternatively, if you are planting seeds, plant them at this time. As you are sprinkling the earth or planting the seeds, chant “Calas” three times and envision the seed’s deep roots and the fertile earth supporting it. Pour a small bit of water near the roots of the growing plant/seed. As you are pouring, chant “Gywar” three times and envision the waters flowing to the seed and the seed’s growth and change. Smudge the plant with a bit of herbal incense (I like sage, mugwort, rosemary, or lavender for this purpose; see my post on smudge sticks for more ideas). As you are smudging, chant “Nwfre” three times and imagine a spark of life shining outward from the center of the seed to facilitate its growth. Say: “May the triune essence of Calas, Gwyar, and Nwyfre bless infuse you with blessing and abundance.” and chant “Awen” (Ah-oh-en) three times to close out the ceremony. Thank you for this beautiful, loving information. And I love your drawings/paintings! Especially the one of the bee on the flowers. Thank you Dana. I love creating sacred space. The atunement with sacred ground, which is every inch of the Mother. Thank you, Mary! The bee one is a work in progress. I wanted to do something with gold leaf that my father had given me, and I like where its going, but its not done yet. The flower is a very sacred one to me–blue vervain. The bees really love it! I don’t know a lot about the Druid path and appreciate your wonderful posts. I learn a lot form them. Love the drawings, too! Hi David – with a name like Taliesin, I’m sure you’ll be learning more about the druid path quite quickly! :). Thank you for the kind words! Any suggestions for your favorite books on the subject? The first book I generally recommend for people to read is a short one by Phillip Caar Gomm called “What do Druids Believe?” Its fine for those who want to just learn about druidry, not necessarily practice it. If you want to actually practice druidry, the book I’d strongly suggest is John Michael Greeris “Druidry Handbook”. Both are reasonably priced :). There’s a lot else out there, but those are really good places to start. Nice to have a review of the 3 Druid elements. I haven’t thought about them in a while! Mushrooms are an interesting case, I think. They seem so earthy–they grow from the earth or help dead matter return to earth, they smell and taste earthy–and yet they’re ephemeral and airy too. They grow, change, and vanish so quickly. They disappear for months or years at a time and you never know when or where they will appear. Fascinating and beautiful as always! Your watercolors are just so yummy! This is great winter inspiration. Let’s see if I can persuade the co-ho garden team to try an herb spiral in one of the beds next season! This is beautiful, and so are your illustrations! I remember reading about the three Druid elements in Greer’s “Druidry Handbook” but haven’t seen them mentioned elsewhere for ages. I would love to have a more natural, Druidic garden but where I rent I can’t do anything except have lawn (boo!). Do you know of any good resources for planting veggies and herbs in pots? Ryan, thanks for the comment! Yes, I do have a few suggestions :). You can buy a book called “Small Space Container Gardening” by Ferrn Richardson. If you hvae even a little bit of space, like a community garden plot, I’d also consider investing in “Square Foot Gardening” by Mel Bartholomew and “Vertical Gardening” by Derek Fell. Thanks, Dana, I’ll add those to my (ever increasing) to-read list. I’d love to get planting in the New Year! Thank you for this lovely article! I love your writings. I learn so much and it helps me go even deeper into my Druid practices and spiritual understandings. I am in OBOD and am still in the beginning of the course. So I had a few questions with applying these concepts into my reality. With Gwyar, is the wind Gwyar? Is the song of a bird Gwyar? And is basically all of the earth and human manifestations in form Calas? What are some other physical manifestations of Gwyar? The inner Gwyar examples life the nutrients flowing into the plants and trees makes sense. The water moving up into the plants is Gwyar. But what are some other examples as I take it in when I am in nature? Hi Mary Beth! Welcome to OBOD and to the course :). The three elements of the druid tradition do not clearly map onto the four elemental system. Anything that offers stability and solidity is Calas (stone, earth, tree trunks, things that are external, like Aristotle’s codiefied words) and anything that is fluid and moving is Gwyar (which might be water and air, but also the growth of plants, the passage of time). The key is the principle of flow and stability. For example: you have structures in your bones and cells that are stable- the solidity of who you are as a human being. That is calas. The flow of blood through your veins, your cell division and regeneration, the flow of digestion, the air flow – that is gwyar. Does that make sense? And the spark of life that animates the body is Nwyfre :). Part of the fun of this kind of system is figuring it all out. I would say that yes, the song of the bird, and the flight of th bird and the movement of the bird are Gwyar, while the bird’s physical body is Calas, and the spirit and life energy in that bird is Nwyfre.